This is a sweet picture taken back in 1960, of my Mom, Dad, me, and all of my sisters, by a local newspaper announcing the birth of their seventh daughter. I am daughter number six and the one in my Dad's arms. Thanks for visiting my blog and for the sweet comment. I hope you'll come back soon. Hope, I am not sure of the answer to your question. All I can say is my Mom never did things small...a bit competative! Love what you have done with the picture. Looks so cute. Very cute! Love it! Wish it got bigger when you clicked on it ... would love to see a close up. Thanks for sharing. This picture is really fun! Came over from MY Romantic Home and you have a beautiful blog. Really nice card. Well, how precious is SEVEN daughters! Good Grief...talk about a blessing. Your picture is just perfect, Holly! Wow! Seven?? What an absolutely fabulous thing it must be too have so many sisters! Love the pic! Welcome to blogland.. the ideals which have lighted me on my way and time after time given me new courage to face life cheerfully, have been Truth, Goodness, and Beauty. . . . and your blog is beautiful! Come visit me at my house in the roses; we'll have some tea. What a wonderful picture. How many bathrooms did you grow up with? Wish we could see a closeup. I love what you did with it. Hi Holly: I come by way of BJ to say hello and welcome to blogland. Six sisters! Wow, I can't even imagine what that would be like...I have two brothers. Cute photo! I'll be back again to visit. Welcome to blogland, I am already loving your blog. Wow, you are very talented, love the picture and what you've done with it! Holly, your blog is beautiful and fun! Thank you for sharing your beautiful home! Very cute picture and I love how you've embellished it! Adorable! And you are blessed to have so many sisters--take that from someone who has none! Nice for you! Welcome to Blogland,I love the way you embellished the photo, it certainly does add a party atmosphere to the picture. Thanks for sharing. 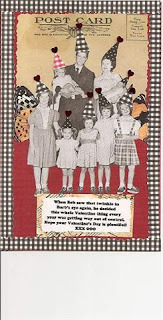 So cute.. what a fun valentine for your siblings.... colorcopy!!! Hi Holly! Cute picture and love that you have a red hat on!!! Clever! Just discovered your blog and welcome to bloggidy land! Enjoy! I love this! Seven girls! I am so tickled by the party hats. I would have wanted a red one, too! Oh that is just darling! Wow, seven -- God bless your parents!